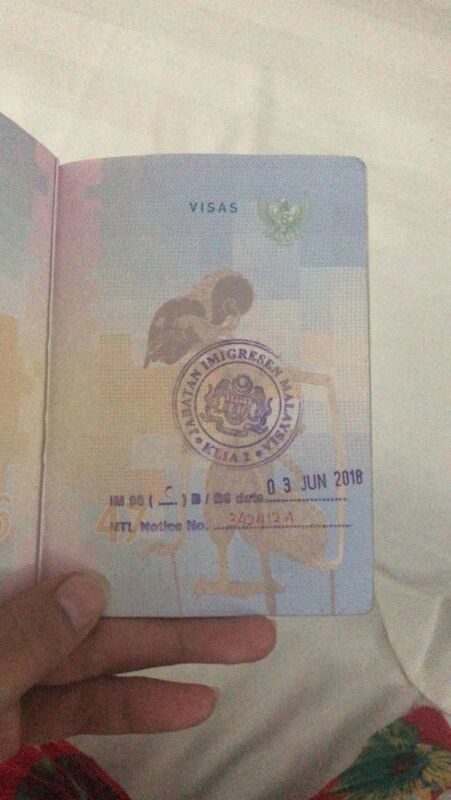 I got NTL when I reached Malaysia from Bangkok, they wanted to send me back to Bangkok but after some negotiation they allowed me to book my own ticket to my home country Indonesia. I told them my company which I’m going to work with is going to apply visa for me after next week, I don’t want to be blacklisted. I have so many questions because I don’t understand why I got NTL stamp. 1. Will NTL stamp in my passport effect the visa processing from the company? 2. How many days can I re-enter Malaysia after NTL stamp? 3. What kind of supporting documents should I bring if I want to visit my aunt and my boyfriend for one week? I don’t want to be blacklisted. You have been blacklisted. NTL is a form of temporary blacklisting. I don’t want understand why I got NTL stamp. No effect. In fact the purpose of this NTL is to make you apply for the appropriate "Visa" to enter Malaysia again. 60 days depending on circumstances. 1. Post a clear image of the NTL stamp here for better understanding. 2. Chart your itinerary of your travels in your passport for the last 5 places. Enter where, exit to where, airport or land border crossing. I exited Malaysia to Bali on 8 January 2018 and entered Malaysia on 25 January 2018. And exited to Cambodia 22 February 2018. And entered Malaysia 28 February 2018. And entered Singapore 21 March 2018. And returned back to Malaysia 24 March 2018. And exited Malaysia on 21 April and entered Malaysia from Indonesia on 29 April and exited Malaysia via ChangLoon on 25 May and flew to Malaysia from Bangkok on 2 June and got rejected and stamped NTL. I showed them my next flight to Cambodia and returned back to Malaysia and end to Indonesia. I have enough cash and gave them the reasons why I’m in Malaysia because my boyfriend is studying in Malaysia. At first they told me to wait and they took me in to the cell, and I negotiate with them not to send me back to Thailand but to book my own ticket to Jakarta and they allowed me. So I just wanted to visit my aunt and be with my boyfriend for one week. So it means it’s not possible for me to enter 30 days after NTL because the officer said you can come back again on 3 or 4 July 2018. So it’s not possible for me to enter before that to stay just for one week? And exited to Cambodia 22 February 2018 . And entered Malaysia 28 February 2018. And entered Singapore 21 March. And returned back to Malaysia 24 March. Third Visa Run Failed... NTL.. !!! You can try, but chances is 80% they will NTL you again and may charge you under another section of the Immigration Act as "Prohibited Immigrant" (This is my personal opinion only). Like you I visited Bangkok (BKK) every alternate month for the past 24 months 12 times. I have no issues yet (touch Thai teak wood). My travels were almost maximizing the 29 days period given by Thai Immigration. The difference is always I have a pre-paid return ticket and it is always KUL > BKK, BKK > KUL. So it is not regarded as "Visa Runs". visa processing from the company? This company located in Malaysia or Indonesia? What is the nature of your work and purpose of travel? From January 2018, your travel patterns appears to be engaged in some work purpose. Be it legal or illegal profession still contravenes current International Laws of Travel. That is why you are given one NTL with reference number. While some other travelers may just get NTL stamp only. They tried to come in after 50 days (my suggestion was 60 days), yet was stopped by Immigration at first instance. After meeting with seniors officers, with valid reasons for the purpose of marriage then only allowed in. What is your valid reason to enter Malaysia on a Free Tourist Pass again? Visit aunty and boyfriend is not strong enough. They can go Indonesia to visit you instead. My purpose was only staying with my boyfriend because he is still studying in Malaysia while I’ve graduated from Malaysia. I showed them evidence that I have more than enough money to spend for three weeks or so in Malaysia. The company in Malaysia is going to apply for me working visa because I’m going to start work in mid of July 2018. I'm glad that you said it won’t effect the working visa processing. Drugs smugglers have more monies to spend as tourists here. It is the issue of Infringements of International Laws of Travels. And for your case... visa runs. Go apply for your work pass as soon as possible. I’ve contacted the company about the visa processing and they told me it's gonna take maximum 2 weeks for the documents to be ready. And yeah I can’t wait because my purpose to work in Malaysia is that it will be easier for me to be with my boyfriend instead of flying in and out of Malaysia all the time. Thanks a lot for your information.